As I mentioned in Essential Shoes of a Man, The Dressy Brown, after a few comments pointing out the lack of content about men's shoes, Julian from Jack of All Travels, has graciously agreed to guest write a few posts about men's shoes. Here is the fourth in his five part series. Rugged boots get you through messy situations (snow, rain, mud, etc.). They're relatively low maintenance; leather is easy to clean and condition these days. They will last you nearly forever (10+ years if you take a little care of them, 5-7 years otherwise). 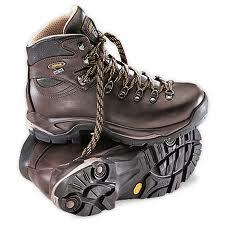 They support your feet and ankles for heavy loads (long days of work, hiking with a pack, shoveling snow). And, depending on what you choose, they look good. The styles of rugged boots are too numerous to go into much detail here; you've got Timberlands, hiking boots, cowboy boots, steal toe work boots, Euro-style boots, and hunting boots. Personally, I like having a pair of good-looking hiking boots around. If you change the laces to something subtle, they do very well pretending to be all of the boot styles and are the most comfortable of all the Rugged Boots out there. Be prepared to drop some dough on a good pair of boots, leather isn't cheap, and you're buying something that lasts you 10 years (Asolo TPS 520 shown, $289). It's a lot of money, but it's a good investment and essential for your manhood. Thanks for reading part 4, the Rugged Boot, of the 5 Essential Shoes of a Man. Check back soon for the finale of the series: The Casual Nike.